Background: Hypertension, diabetes and neurodegenerative diseases are among the most prevalent medical problems around the world, costing millions of dollars to the medical health systems. Indeed, hypertension has been associated with higher risk for decline of cognition, as evidenced in patients with Alzheimer´s disease (AD). Furthermore, there is a clear relationship between hypertension and diabetes, reflecting substantial overlap in their etiology. Calcium (Ca2+) channel blockers (CCBs) have been classically prescribed for treating hypertension because of their mechanism of action due to reducing the influx of Ca2+ into the smooth muscles cells. In addition, many clinical and experimental studies have been demonstrating pleiotropic effects for CCBs. For instance, in hypertensive patients treated with CCBs, it can be observed lower incidence of neurodegenerative diseases such as AD. The virtual mechanism of action could be attributed to a restoration and maintenance of Ca2+ homeostasis, which is dysregulated in the neurodegenerative diseases, including also a reduction of neuronal apoptosis as part of these CCBs pleiotropic effects. Similarly, in hypertensive patients treated with CCBs, it can be observed an improvement of diabetes status such as glycemic control. A possible mechanism of action under debate could be attributed to a restoration of insulin secretion, then achieving glycemic control, and reduction of pancreatic β-cell apoptosis. Conclusion: Considering the discovery of our group entitled “calcium paradox” due to Ca2+/cAMP signalling interaction, in this review I discussed the virtual involvement of this interaction in the pleiotropic effects of CCBs, including the possible role of the Ca2+/cAMP signalling interaction in the association between hypertension and higher risk for the decline of cognition, and diabetes. 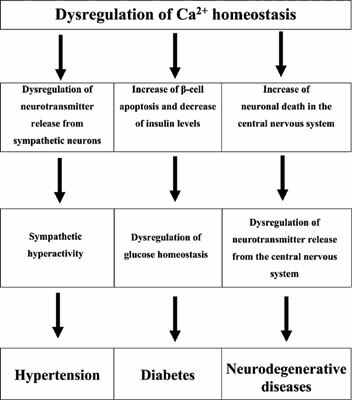 Hypertension, diabetes, neurodegenerative diseases, Ca2+/cAMP signalling interaction, Alzheimer's disease, apoptosis.